Terminal Status: ONLINE (Updated for GMS 203.4) - Last Updated 04/11/19 (04/11/19) Terminal has been updated for GMS 203.4 minor patch! No re-download required. (03/22/19) Terminal has been updated for GMS 203.3 minor patch. 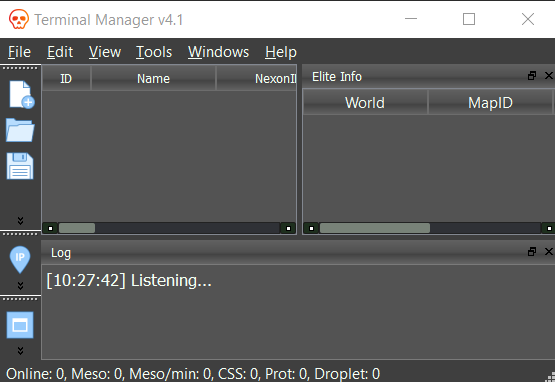 You MUST download the new terminal manager (v4.1) to use Terminal on latest game update due to changes with Nexon Launcher. (02/28/19) Terminal has been updated for GMS 203.2 'Arcade Adventures' major game patch! (02/28/19) Terminal has been updated for GMS 202.4 minor patch! Here you can find the latest announcements and updates in regards to the forums. We encourage you to stay tuned! Here we host spectacular, rewarding contests and events! Try entering one to see if you can win one of the grand prizes. At the contest paradise, the prizes are worth your time. Have questions or suggestions for GameKiller? We value your thoughts and we would love to hear what you have to say on what we can improve in our community. Come in with an entrance or leave with a bang. Hold any general or hacking discussion related to MapleStory here. Hold any general or hacking discussion related to MapleStory 2 here. Hold any general or hacking discussion related to MapleStory M here. Hold any general or hacking discussion related to Elsword Online here. Releasing any cheats, cheat tables, hacks, bots, etc.. for any games that doesn't have it's own respective section here. Feel free to chatter about anything and everything off-topic that you wish. GK is here to listen and reply to all your obscure topics. Ready to show of your artistic side? How about you check out the amazing work submitted by our community or even enter a contest! Looking to make a quick buck? These guides will help you! Learn how to make money on the internet - From Whitehat to BlackHat, it's all here. General Programming discussions, queries, game hacking source codes, tutorials, and chat. Electronics discussion - including consoles, portable gaming, gadgets, and computers. Recruit friends for games, show off your rig, and much more. In this section you can buy, sell and trade Elsword ed, Elsword items, and Elsword accounts. In this section you can buy, sell and trade MapleStory mesos, MapleStory items, and MapleStory accounts. In this section you can buy, sell and trade MapleStory 2 mesos, MapleStory 2 items, and MapleStory 2 accounts. In this section you can buy, sell and trade MapleStory M mesos, MapleStory M items, and MapleStory M accounts. In this section you can buy, sell and trade MapleStory Private Server mesos, MapleStory Private Server items, and MapleStory Private Server accounts. Here you can buy, sell, or trade anything for other games that we don't offer a dedicated section for. This section can also be used to trade items such as gift cards, codes, and more. Have any excellent or unique services that you can provide? Come in to advertise or sell it! In this section you will find tutorials and hacks for different Android games using the Game Killer APK APP. Want to request hacks for an Android game that doesn't have any available hacks, ask questions, get help with the app, or just talk about anything related to the Game Killer APP? post them here! Post here if you have been scammed during a trade, or while selling, or buying an account.